Kitchen Curtains, Valances & Window Treatments | Collections Etc. Instantly add a bit of whimsy and warmth to the heart of your home with kitchen curtains and valances from Collections Etc. Your kitchen windows are a focal point of the room. Framing them with treatments featuring popular patterns, eye-catching colors and adorable themes brings a delightful ambiance to the kitchen. Kitchen curtains are a must for filtering out light, providing privacy and adding a dash of style, while valances provide flair to tie your kitchen décor together. 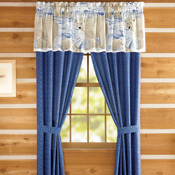 Choose from café curtain sets that include half-curtains and valances, or opt to buy panels and valences separately. Create a cozy, country kitchen with our floral and garden-inspired kitchen window décor, or provide a warm and welcoming look with our darker plaids and patterns. Go for sheer or lace for an easy, breezy feel, or go bold with kitchen curtains and valances featuring darling details such as pompoms or embroidery. Decorating with our floral, bird and popular themed curtains fills any kitchen with cheerful character. To keep things interesting and fun, we’re consistently adding new patterns, styles and colors to our collection. As with all items at Collections Etc., these products come with easy returns and exceptional customer service. You’ll enjoy a great value, no matter which options you choose. In fact, the value is so great and selection so vast, you can swap out your window coverings and drapes to match your mood, the changing seasons or holidays. 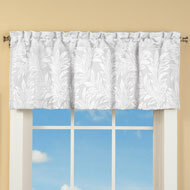 Get a different window treatment for spring, fall, winter or summer. 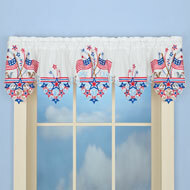 Celebrate with curtains for holidays like Halloween, the Fourth of July or Christmas. 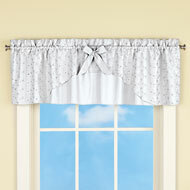 Start browsing our collection of kitchen curtains and valances today.